I have a much better hit rate when I sew from patterns than when I make up patterns from scratch, but I still get a bit overwhelmed when I'm in the fabric store and I'm trying to choose a pattern to buy, especially a pattern to make a garment for me. It's hard to know from the pictures in the big pattern books which designs fit well or have good instructions. And when they cost upwards of $10 each, I'd rather not fork out for too many duds! That's where I've found that Pattern Review really helps. It is kind of like a Ravelry for sewing patterns. There is a searchable database of patterns and when people make up a garment from a pattern they can post pictures of the finished product and write a review. It can really help you narrow down just which cross-over top pattern or A-line skirt pattern is going to turn out how you want it. Just last week Pattern Review did a round-up of their most popular patterns of 2008. Read the list here and join up to become a member (it's free!) and get on their mailing list here. What other resources do you know of that can help us crafters pick out the gems in a sea of patterns? I agree Pattern Review is an excellent reference. 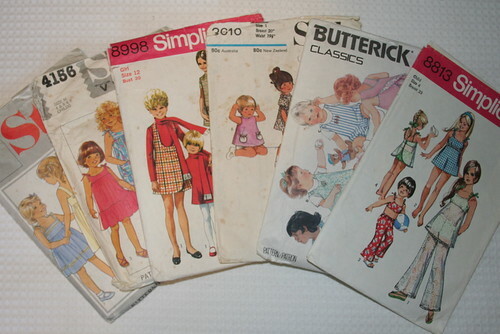 For my retro sewing, I like visiting www.sewretro.blogspot.com. Lots of tips here on improving the fit of older patterns, plus sewers share their experiences of retro patterns they've sewn. I love Pattern Review too. I love the "home sewn" quality to a lot of the garments. Just ordinary folks with ordinary figures enjoying the sewing process. It's a very inclusive and supportive website... and there's a little something for every sewer. I am also very fond of Burda style. http://www.burdastyle.com/ People make an effort there to be quite fashionable so the pictures and projects can be amazing. hey grest link - i've got my eye on a few patterns now! I have co-founded a website named SeamedUP.com that is a great resource for quilters/sewers who are looking for a place to track their stash, patterns, notions, books, sewing machines, projects, etc! You can see how others have used the fabrics you own or how they interpreted patterns. So fun. We are a young site with many plans for the future. The team behind the 'we' is myself (hi!) Allison from the Within A Quarter Inch podcast and Brye from the Sew Stitch Create Podcast. We are working with many industry leaders (moda, robert kaufman, freespirit, riley blake, etc) so that our database is pre-filled with all of the information you can think of! Just click 'add to stash' and voila - a personal stash online. We are open to your suggestions and would love to have you join the ride.